MPL Ford is not officially authorized to sell the Endeavour, only Chennai Ford is. I was also not clear about this in the days leading up to the launch and wasted precious time in booking. Loved the video of assisted parking, and also getting perspective of existing Fortuner Owner's Perspective. Great job! Thanks to special review from a Fortuner owner as well. That really helps to make decision quickly. Any details on how it works? Clutch pack? Viscous coupling? Geared? Lockable? Without these details "active transfer case" is just words. The previous gen had a Torsen. So this is an e-locker? Only thing that I wonder is, why pros and cons of all competitors are mentioned except Pajero Sport where just links of ownership treads are posted. The reason why we haven't included likes and dislikes of the Pajero Sport is that Team-BHP hasn't officially tested this SUV, hence we have included links to some detailed ownership threads, where prospective buyers get a fair idea of the vehicle from real user experiences. Similarly, the SsangYong Rexton doesn't feature in the competitor's post as neither have we driven it nor is there any ownership report on Team-BHP. We booked the Ford Endeavour 3.2 Titanium about 3 weeks back but took a test drive only today. How I wish Team-Bhp could be the first to review all cars!! This time we took the right decision to buy this car but Team-Bhp reviews just about sum it all up so damn perfectly! 1. I currently drive a 2013 Fortuner 3.0 AT 4x2. When I just leave the brake pedal and without accelerating at all, the Fortuner pushes itself wayyy more than the Endeavour. Why is that? 2. When I stopped the Endeavour on a slope (a bit more steep than a regular flyover), and left the brake, it slowly started rolling back after 3-4 seconds. Never faced this with either my Fortuner AT, 2013 BMW 320d AT, or even the 2014 Polo AT. Should this happen? Or is there a setting to avoid this or something? Ford Endeavor though not old school like the outgoing model is still a very good SUV. I want to know how it stacks up against the Pajero Sport and Fortuner when it comes to reliability. Can someone please shed some light? 2. When I stopped the Endeavour on a slope (a bit more steep than a regular flyover), and left the brake, it slowly started rolling back after 3-4 seconds. Never faced this with either my Fortuner AT, 2013 BMW 320d AT, or even the 2014 Polo AT. Should this happen? crazy_rahul, congrats on the new SUV. The Endeavour has Hill hold assist, it will keep the SUV from rolling backwards for few seconds on a slope. I don't know what happens when you keep the other vehicles you mentioned on a slope. That's a mind blowing review of a mind blowing SUV!!! This truck is fully loaded with most of expected (and beyond) features. Of course it misses some basic features as mentioned. I would like to get a couple of things clarified. You have mentioned about the "Electric Sunshade" buttons. But what exactly does it do. I might sound lame, as I have not heard much about this before and little anxious to know about it since we still have a ban on using Sun Film (restricted to visibility). And other thing is about the "Arm Rest Console". Is it Air Cooled like what we have in XUV. If not, it is a much needed feature for a vehicle at this cost. Swallowing a couple of 1 lt bottles and if it is Air Cooled!!! There is noting like it on a mid day summer drive. Yesterday, did a 'Dekho' of the new Endeavour at Elite Ford, Marathalli. I am quite impressed by it. The exteriors have been executed well, they help mask the enormous size of the SUV but still give it the butch look. Side profile is also good and it doesn't look stretched like the previous generation. Though I like the tail section's design, I wished Ford mounted the spare wheel instead of hiding it away. It would have completed the look. Also, since all its direct competitors follow the same design, a rear mounted spare wheel would have been the differentiating factor. Could not get into the car, but the interiors looked spacious. The color theme is also tasteful. Ford has brought a winner to the market. Lucky are the people who have 25 big ones to spend. They are spoilt for choices now. Thank you very much. I meant to ask, Should this happen on the Endeavour? Because on my 3 series as well as the Fortuner, they don't roll back at all normally. Also, could someone also answer my other question? I currently drive a 2013 Fortuner 3.0 AT 4x2. When I just leave the brake pedal and without accelerating at all, the Fortuner pushes itself wayyy more than the Endeavour. Why is that? Got an input that only trend models have been billed and still no update regarding billing of titanium models.. any input on when ford is planning to start the deliveries. I read on the forum that 480 units were sold in January. Where did they go and who were they delivered ? Is ford counting the demo vehicles sent to the dealership as no of units sold. The Engine Idling RPM is higher in fortuner hence it drags the vehicle if u leave the brake pedal considering the car is in drive mode "D" Hence the difference you feel "way more than endy" whose Idle RPM is lesser. You can get it altered though, but i suggest you keep it that way for better fuel economy when driving in traffic. Last edited by ravelsnip@gmail : 19th February 2016 at 11:19. Yes. Dispatches from Factory are counted as per the standard process and all companies use the same methodology. I happened to call Ford customer helpline today as I did not have any acknowledgement or confirmation of my booking. They could see the booking on the system and did have my details and also updated me that the deliveries for Titanium 3.2 would be max 60 days from booking or earlier. Like i told you before in the other thread or this one, your booking has not been sent to ford from your dealer, else you would have got an email by now. Thanks for the amazingly detailed review S2. I happened to see the new Endeavour last weekend when I went for my Figo's servicing. The car sure has presence and what stands out the most from the side profiles are those huge 18inch wheels. Its a true american SUV. Kudos to Ford for providing all the features and technology and still pricing it realistically. Ofcourse 30 lacs still not realistic for most of us though . 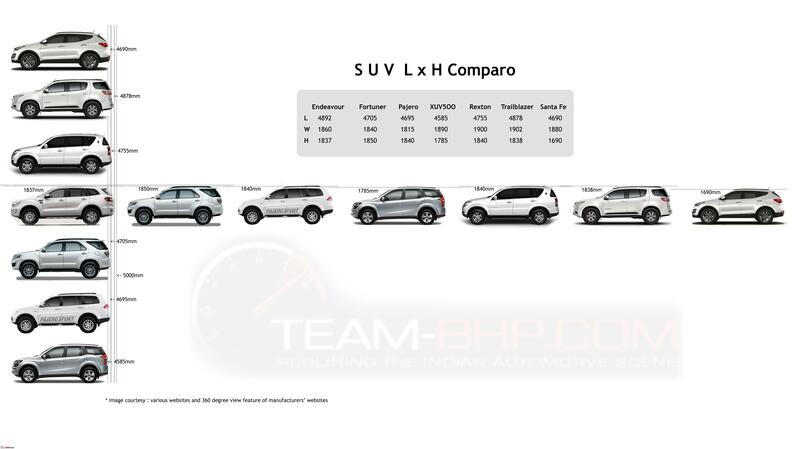 The Endeavour is the longest of them all while the XUV5OO is the shortest by a good 307mm. Wonder how much of a difference it makes in the interior space? I think this is where Mahindra virtually beats everyone hands down for the first 2 rows. I have sat in fortuner, new and old endeavour, Rexton and nothing beats the space and seat height esp for middle rows on XUV. This probably is because of monocoque construction cause both in Fortuner and Endeavour the floor does seem a tad bit high reducing under thigh support for mid rows.